In my research for this post I discovered a fair number of divergent opinions on the exact number of verses and chapters in the Bible. There are many good reasons for this — including the many variations of modern translations of the Bible. Compare the text shown in the photo with the text below. It is different. The original King James Version (KJV) which was completed in 1611 is considered the most authoritative of the English translations in use today. It is the basis of the figures quoted here. 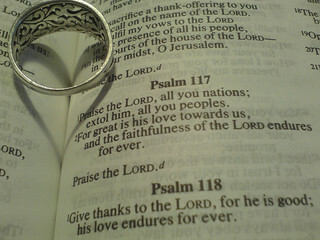 Some noteworthy and remarkable facts are floating around in my head regarding Psalm 117. There are 1189 chapters in the Bible. The very center chapter of the Bible is the 595th chapter. This is Psalm 117 which also happens to be the shortest of Psalms or chapters in the Bible. I disagree with your assertion that the KJV is considered to be the most authorative version around today. As it is over 400 years old, it does not include any of the theological research that has been completed in that time. For example, that the original Greek was not classic Greek as presumed by the translators 400 years ago, but Koine Greek. More modern translations include this and other theological and linguistic advances and as such are closer to the original intent of the authors and therefore more reliable and authoritative. Agreed. While the KJV had an incalculable influence on the English language, in many ways establishing a more common form of spoken and written English which could be used throughout the kingdom, it is not the most accurate or helpful. It is strange how many cling to it as the only authoritative source. One would have to examine what is meant by “authoritative” . . .
Je suis content que ça vous plaira.